The Institute, Kelvedon’s Village Hall, was funded by public subscription and built in 1911 and continues to be run by a Management Committee. Throughout the 1990’s it became clear that, as well as refurbishment and modernisation, the building needed to be able to expand to cope with increasing demand. Eventually, Kelvedon Parish Council bought from Essex County Council the garden of Kelvedon House, a boys’ home located immediately behind the village hall. The Council used part of the site for a much- needed village car park and offered the remainder to the Institute on a peppercorn rent. The Hall Trustees consulted RCCE’s Village Hall Adviser and on her advice engaged the firm of Burr and Neve LLP, Quantity Surveyors with village hall experience, to carry out a feasibility study, most of which was funded by grants from the Parish Council. 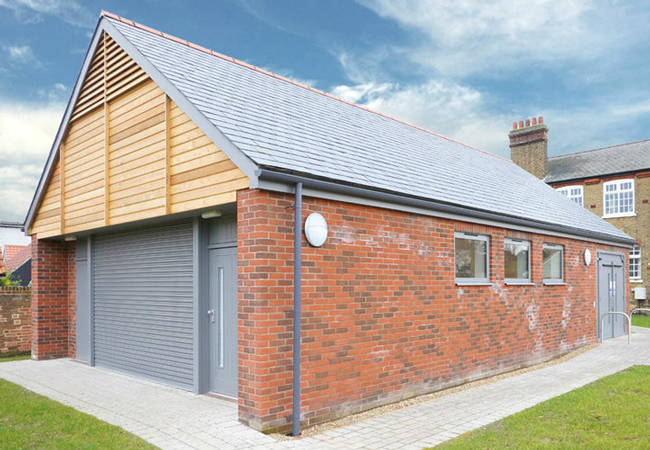 The next step was to generate a Business Plan and the Hall’s Building Sub- committee interviewed four architects before commissioning Inkpen Downie Architecture & Design Ltd to design the “Small Hall” - a simple separate building close to the rear of the existing hall. Planning permission was granted in late March 2013 and an immediate windfall, an anonymous private donation of £15,000, started the fund raising in earnest. Initially it was thought that the cost of the building would be £190,000 plus fees, and applications to every grant making body began, bringing the realisation of the complexity of such a project. RCCE provided a list of potential funders and this was supplemented by the regular lists published in the Village Halls newssheet. The hall was already a member of the National Council of Voluntary Organisations and took full advantage of its weekly funding list – an extremely valuable resource. The Hall’s own funding group, Friends of the Institute, organised a range of events - none brought in large sums but they all kept fundraising efforts in the forefront of public attention, resulting in further local private donations. In June 2015 (just 2 years 3 months after Planning Permission was granted), work started. At the last minute, Garfield Weston gave us a rather unexpected £20,000. Every grant and donation proved the worth of the scheme - sometimes we were like children opening Christmas presents as e-mails or envelopes arrived with good news, sometimes (particularly at the beginning) we were despondent (particularly when the Lottery turned us down flat) but members of the fund- raising team urged each other on. Lessons learnt - tailor your application to the potential donor; always make sure what you are saying is firmly based; don’t give up; support each other and use all available local skills and expertise to monitor the progress of your build (that saved us at least £10,000) - it’s hard work and it’s not going to get any easier! £223,000. Are we pleased? Yes. Is the new hall used? Yes, with regular classes, lots of parties, meetings, exhibitions and consultations and even a wedding reception and, a more sombre occasion, a wake. Bernard Sunley Foundation, Blackwater Aggregates, Braintree DC, Essex CC, Fowler Smith & Jones Trust, Garfield Weston foundation, Greenfields Community Fund, Kelvedon PC, PJK Charitable Trust, Rank Foundation, Tom Amos Charity and Veolia Environmental Trust.